For wine aficionados, the Ski Tip Lodge’s wine pairing dinners are a must because that’s when the sommelier rules. Normally, a chef creates a menu, and the sommelier chooses wine to complement the cuisine. But at Ski Tip’s wine pairings, sommelier Megan Morgan becomes first in command: She has free reign to select wines based on a theme, and then chef Kevin McCombs matches her selections. Tuesday, she sweeps guests away to Italy and Greece with her island escape wine pairing, and on March 31, she presents a tour of Eastern Europe. Simply stepping into the Ski Tip Lodge, located 2 miles east of Keystone Lodge, is a charming experience in and of itself. It is the oldest ski lodge in the state. In the 1860s, the log cabin served as a stagecoach stop between Georgetown and Montezuma. In the 1940s, Max and Edna Dercum purchased it, and by 1945, they had jerry-rigged a towrope at what is now Arapahoe Basin. Sitting in the comfortable oversized chairs and allowing the eyes to wander from the huge stone fireplace enclosing blazing flames to the corner window overlooking the glow of Keystone’s nightlights, stress melts away. And that’s even before guests take their first sip of wine. On Jan. 25, Morgan hosted a dinner based on the history of wine. She began with a sparkling descendant of Roman wine, thought to be the most ancient wine grape. After a brief description of how archeological digs extract grape and wine remains, which can be identified through DNA profiling, Morgan explained how people historically made sparkling wine: They submerged half-fermented musts in cool mountain rivers to stop fermentation, then sealed the bottles, where fermentation continued. The second wine, known as the finest of the Roman Empire, was actually introduced to Italy by the Greeks. The Feudi di San Gregorio Falanghina is fuller in body than many Italian wines, and paired with wild baby arugula, fresh mozzarella and Tuscan-marinated tomatoes, the acidity in both the wine and food literally makes the mouth water and aids digestion. By the time Morgan served a modern-era chardonnay, the room enlivened with chatter, as guests enjoyed the pan-seared caramelized sea scallop adorned with prosciutto and cantaloupe salad, honeydew syrup and coconut creme fraîche. The fifth offering carried a bit of intrigue: The Chateau Musar Rouge came from Bekaa Valley in Lebanon. The vineyard is the only one that has been maintained and continued production throughout the Lebanese Civil War; it is respected, almost as a miraculous place. It sits in the region where Jesus changed water into wine, performing his first miracle at the wedding of Cana. The night ended on a sweet note with an orange creme caramel paired with a heavy-duty (20 percent alcohol content) vintage port; the Barros, Almeida Ca. Colheita from Portugal has gained an international reputation for producing the finest tawny ports. The 1979 bottle had remained in the barrel for 30 years, producing a smooth, elegant and nutty flavor. This month’s wine pairings hold promise to be as magical and delectable as last month’s. 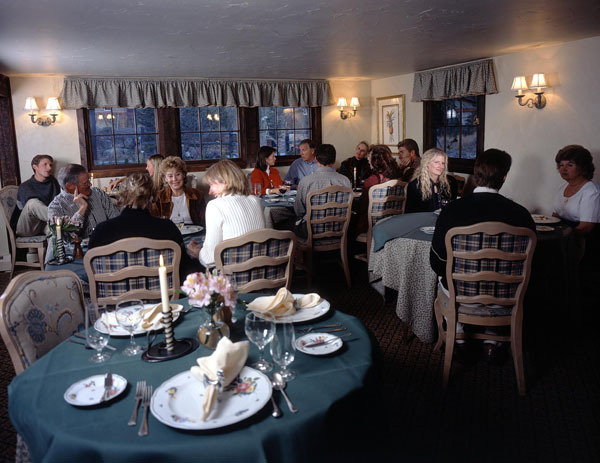 For reservations, call (970) 496-4950.